Six Canadian mountain runners will head to Tepatitlan, Jalisco, Mexico, on June 15th for the 5th NACAC mountain running championships. The CTMRA selected Ryan Hayden, Adam Campbell, Jason Loutitt, Olivia Yuel, Courtney Harcott and Brooke Spence to represent Canada in this 13km uphill race against top mountain runners from host Mexico, and the USA. Ryan Hayden has the widest range of any Canadian climber. The sub-4 miler and 1:04 half marathoner was also part of the second place team in the 2007 Gore-Tex Transalpine-Run, setting a course record in the hill-sprint stage. 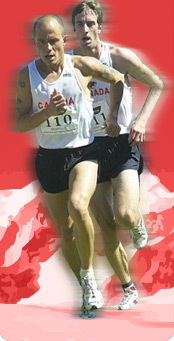 He also represented Canada at the IAAF world cross country championships in 2004. Adam Campbell finished 15th at the world long-course mountain running championships at the 2007 Jungfrau marathon. He was 8th at last year’s NACAC mountain running championships in his international mountain running debut. He is currently training under the tutelage of mountain running legend Jonathan Wyatt. Jason Loutitt spent the 2007 season running around the world with Blue Planet Run. After running clear around the planet, he’s back in Vancouver and training for a return to the international mountain running scene, where he has represented Canada on numerous occasions. He is the 2008 Canadian Snowshoe racing champion. Courtney Harcott has a half-marathon personal best of 1:26:30, and three wins in the 2007 Alberta 5 Peaks series. Brooke Spence won the 2007 Seek the Peak Ascent at Grouse Mountain, and has a best time on the Grouse Grind of 35:15. Brooke was a all-star NCAA rower at the University of Louisville from 2001 to 2005.